The CCPA (California Consumer Privacy Act) is a new California law aiming to regulate the flow of personal data between businesses. The act will expand the privacy rights of California consumers and require businesses to disclose the what, why, and how of the use of consumers’ personal information. It will also allow California residents to forbid companies to sell their data. People desire privacy and more control over their information. California consumers should be able to exercise control over their personal information, and they want to be certain that there are safeguards against misuse of their personal information. It is possible for businesses both to respect consumers’ privacy and provide a high level transparency to their business practices. Failure to comply with these new laws could be costly to businesses, with penalties up to $7,500 per violation. Because information about clients is a marketer’s goldmine, many people operating in the field now fear that the new law will deprive them of valuable customer insights. But is this really the case? In this post we will discuss the most important aspects of CCPA and present some actionable steps marketers should take in order to prepare for it. But first, let’s answer some basic questions. When does CCPA come into effect? Who will be affected by it? Considering that California is now the fifth-largest economy in the world, it would be no exaggeration to say that the law will affect virtually every mid- to enterprise-size business with a global presence. “Unique identifier” means a persistent identifier that can be used to recognize a consumer or a device over time and across different services, including but not limited to, a device identifier; Internet Protocol address(es); cookies, beacons, pixel tags, mobile ad identifiers, or similar technology; customer number, unique pseudonym, or user alias; telephone numbers, or other forms of persistent or probabilistic identifiers that can be used to identify a particular consumer or device. It turns out that, just as in the case of GDPR, tracking cookies and other types of online identifiers are also included in the scope of the regulation. This means that CCPA covers not only marketers with an arsenal of dedicated tools (like CRMs, customer data platforms, or email automation software), but also everyone who simply captures non-anonymized analytics data and uses it to improve user experience on their website or app. What changes does CCPA bring? CCPA is one of the most revolutionary data privacy acts in the United States. Many experts claim that it will open the door for the US to make consumer data privacy rights a priority. With that in mind, it’s no wonder that the list of changes it introduces is long and complex. Besides that, consumer requests should be processed within a 45-day timeframe. 2) People can request to have their data deleted or to stop the sale of their information. Businesses will be required to have a “clear and conspicuous link” on their website’s homepage titled “Do Not Sell My Personal Information.” The link would take users to a page where they can opt out of having their data sold or shared. 3) California residents have the right to sue a company that uses their stolen data or data that was disclosed to them by a data breach. In addition, they can also sue companies that were negligent in the way they handle their data (for instance, data was not encrypted). 4) There is a mandatory opt-in with regards to selling the personal data of minors (under 16 years old). News about CCPA made the rounds roughly a month after the new European data privacy law – GDPR – came into force. This has inspired people to look for similarities between these two laws. Indeed, both initiatives are designed to increase transparency in the handling of personal information. They also aim to give people more control over how companies use information about them. CCPA addresses a slightly different problem than GDPR – its main focus is to prevent the sale of consumers’ information to third parties without their consent and knowledge. However, unlike the EU law, California regulation doesn’t give consumers the opportunity to say no to collecting their data. As we’ve mentioned before, although consumers can request the removal of their data from a company’s database and demand it not be sold to other parties, they can’t do anything about the fact that businesses collect their personal information in the first place. This means that companies will be allowed to continue collecting information about a particular individual even after they remove their data from their databases. 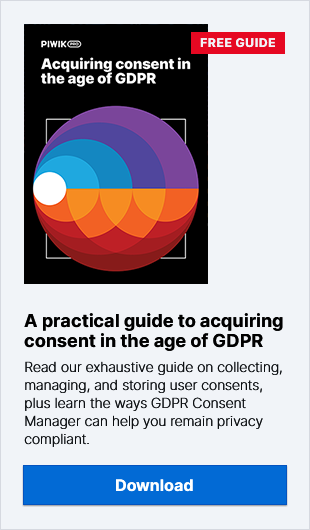 Another major difference is that under GDPR you need to acquire users’ consent before you start processing their data. In the case of CCPA, companies don’t have to collect consents – it’s on the user to actively oppose their data being shared or sold. However, as we’ve mentioned before, this rule doesn’t apply to minors (in their case an active opt-in is required). Under GDPR, there are several legal bases for lawful data processing. One of them is legitimate interest. If a company has enough evidence to prove that the processing of personal data serves its legitimate interest, they don’t need visitors’ consent to process this kind of information. Also, they don’t have to handle data subjects’ requests for deleting, rectifying, or disclosing data. You can read more about it here. How to prepare for the new law? The new California law continues to stir controversy and many of its provisions will have to be clarified. However, 18 months is really not a lot of time, so it’s worth taking some steps to comply with its provisions. One of your most important tasks is to diligently examine your data inventories. You’ll have to map every piece of personal information about your customers gathered by your marketing and sales tools. Then you’ll have to make sure that the data is well prepared for access, deletion, and portability requests from your clients. That may include checking if your marketing software vendors are up to the task and will help you fulfill these obligations. If not, you may want to consider switching to another, more privacy-oriented vendor. If you’re interested in a privacy-friendly marketing stack, be sure to check out our product. Piwik PRO Analytics Suite is a collection of secure and capable software that helps our clients comply with the most stringent data regulations around the world, including GDPR, HIPAA, and now CCPA. Companies that buy customer data from third parties should always make sure that it comes from a legitimate source. The new California law should make you think twice (at least) before you decide to use data from unverified vendors. Under CCPA, operating on stolen or breached data is an offence that can result in hefty fines. Under the CCPA, businesses must provide at least two methods by which consumers can make their requests, including a toll-free number and an online form. The link to those forms should be placed somewhere on your homepage, along with the text: Do Not Sell My Personal Information. Also, you’ll have to think through your internal processes for handling consumer requests. To make this task a bit easier, you might want to use some dedicated tool to automate things. There are a few solutions available on the market that simplify the process of collecting and handling GDPR data subject requests. Considering that those are almost identical to consumer requests under CCPA, these tools could be used for both purposes. If you want to learn more about the capabilities of consent management tools, we advise you to visit GDPR Consent Manager page. As we’ve said earlier, the California Consumer Privacy Act will probably evolve owing to lobbying and some fixes to errors in its current version. That’s why it’s extremely important to stay in the loop and see what the future will bring. We hope that this blog post has given you a decent overview of the upcoming law and provided some actionable advice on how to prepare for it. However, if you want to learn more about the CCPA, we invite you to follow our blog for news and updates.